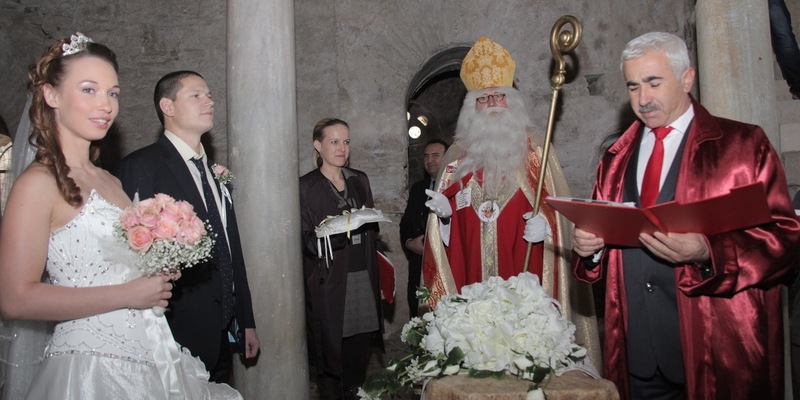 ‘International Saint Nicolaus Wedding Festival’ will be held on 19 December in Demre Region of Antalya. This festival will be organized by Wedding City Antalya and Sunrise Tour at Santa Claus Church. A couple from Russia who have the best love story will be brought to the church and have a marriage ceremony free of charge. After the announcement, 50 couples from Russia sent their love stories for getting married in this beautiful church. A special council evaluated the applications and decide the most effective story which is the story of Pautkina Natalya and Valeriy. Pautkina Natalya and Valeriy will get married in Saint Nicolaus Church on 19 December. A traditional Turkish wedding will be organized for the couple and the couple will accommodate in the Limak Limra Hotel which is the sponsor of this organization. The couple will be taken from the hotel to the Santa Claus Museum and in there their marriage ceremony will be held. Russian couple will make their honeymoon in Limak Limra Hotel. The Russian couples story was: ‘’Hello, I want to share with you our life changing story which is the main topic of this competition. We met 7 years ago and the moment we met we said this was destiny. It was something like you met with a stranger and suddenly that person became your family. You understand that this person is your second half. This is what happened in our life. We wanted to spend all time together, breathe together and love this life together. Even now we feel the same. However we had our moments. The moments which I remember as black eras but I want to thank god because we were strong enough to continue our relationship, meanwhile we came to Turkey for a holiday. Our relationship was not going well those times, so it was not a holiday spiritually. One day our guide in hotel said that we are going to have a tour and we will also visit Saint Nicholaus Church. Then we went. Afterwards I learned that the prayers I prayed in Saint Nicholaus Church have been accepted. What happened? When I came back to Moscow I learned that I was pregnant. That time we understood that this is a message from God and our relationship gains its passion again like we became like we used to be in the beginning. We continue to love each other and after 9 months we had our daughter named Darina (Present). One year later we had our son. Now I am so happy that our lives went this way. Antalya Cultur and Tourism Ministry held a marriage ceremony for the winner couple of ‘’the greatest love story’’ competition in Saint Nicholaus Church. International Saint Nicholaus Wedding Festival which is organized by Demre Municipality, Antalya City Culture and Tourism Ministry, Sunrise Tour and Wedding City Antalya Company rewarded the greatest love of Russia this year. The couple is invited to Antalya as part of the project which is organized for improving the alternative tourism in Antalya. All costs of the couple covered by project’s solution partners and couple was brought from the Limak Limra Hotel with VIP car and taken to the Saint Nicholaus Church. The couple entered the church on white carpets and Demre Municipality Minister Süleyman Topçu held their marriage ceremony. Topçu gave gold as a present to the couple. The witness of the couple was the volunteer introductory of Saint Nicholaus, German citizen Wolfgang Kimmig Liebe. After the ceremony couple released white doves with their witness Liebe. White doves symbolizes happiness. Rose petals was sprinkled to the couple. Gulseren Ozdemir, General Manager of international wedding operator Wedding City Antalya mentioned that 19 December is a very important day for Russian Orthodox people as Saint Nicholaus passed away on 19 December. This is why we choose this date. In this way we will attract the people to get married in Antalya. The Santa Claus Church in Antalya Demre Region hosted 2 couple for their marriage ceremonies. Süleyman Topçu, the minister of Demre Municipality held their marriage ceremony on 19 December which is a holy day for orthodox people. The couples; Turkish Sedat Muacir and Russian Elena Cagapola and Romanian Vasile Nistor and Rodika Vladcoşkulu made a photoshoot in front of the Saint Nicholaus effigy. Afterwards the couples came to the church with their bridal vito cars. During their ceremonies, Antalya State Opera and Ballet Orchestra artists played live music trio. The couples released white doves outdoor to the sky after they got their marriage license. Then they watch a folkloric show by elementary school of Demre. Afterwards they had a cocktail and they went to the celebration which is organized for them at Tekirova Region. The international wedding tourism which becomes popular among the couples who are thinking to get married is improving in Turkey also. Gulseren Ozdemir, the general manager of the international wedding organizer Wedding City Antalya said about the project that they’ve been working on this project for 5 years. The tourists who are coming to Antalya with tourism is approximately 10 million this year. This number increases 10% each year. Saint Nicholaus Church has been visited by 485.000 visitors last year. For orthodox people visiting the church considered as being a pilgrim. We thought why we don’t organize a wedding in there. Culture and Tourism Ministry gave permission for marriage ceremonies in Saint Nicholaus Church for the first time this year. Gulseren Ozdemir, general manager of international wedding operator wedding City Antalya mentioned that she was campaigning for this project for 3 years in international basis and it worth it. She said that Antalya entered the wedding tourism sector late but improving fast. Antalya is lucky for its natural beauties and wedding couples should choose Antalya for their dream wedding. Ozdemir also mentioned that they had an agreement with over thousand tourism company in the world.